Exhibition Dates: Dec 5, 2018 – January 27th, 2019. 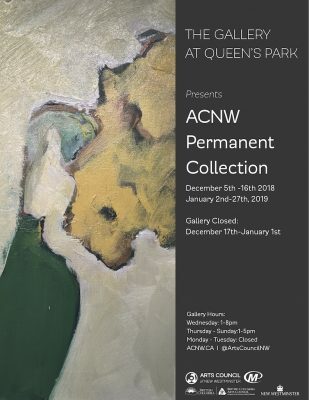 The Arts Council of New Westminster’s permanent collection of artwork consists of a variety of styles and mediums of various artists and patrons that have been connected to the Arts Council over the past fifty years. This year’s exhibition is a curated selection of natural landscapes and floral still lifes from the permanent collection. The styles of the different works range from abstraction to hyper-realism, exploring the subject matter in oil, acrylic, and watercolour paint. This selection of paintings and prints serve as an homage to The Gallery at Queen’s Park’s unique natural setting, and during our winter season, this exhibition offers a gentle reminder of the richness and vibrancy within nature.